Airport Lounges are a great place to relax and pass the time while you wait for the flight. Inside an airport lounge you can avoid the manic crowds in the terminal building and forget you are at an airport. Usually food and drink are included in the price of the airport lounge entry so you can enjoy some great food. Quite often people think airport lounges are exclusively for business travellers or prestige passengers of certain airlines, and this is the case for many airline catered airport lounges such as British Airways Airport Lounge. However, there are airport lounges at Gatwick Airport where anyone can enter for a small price. You can enjoy the luxury of a lounge from as little as £18 in some lounges. Adults and children are usually welcome so you can entertain the children before the flight. Depending on the airport lounge facilities, you can usually enjoy a range of facilities such as spas, hairdressers, free drink and food, free Wi-Fi, movie screens and much more. Here you will find all the information you need to decide which airport lounge to book with. You can use the form to the right to search and book specific lounges or read on below to find out more about each lounge available at Gatwick Airport. It doesn’t matter what airline you fly with, anyone can enjoy airport lounges. Aspire and No.1 Traveller welcome all passengers for a small fee. However, the British Airways Club lounge is only available to those flying with BA in Club Europe, Club World or First class, are a Silver or Gold member of the BA Executive club or are an Emerald or Sapphire member of one of the oneworld airline frequent flier programmes. Visitors to the Gatwick Airport Guide can get 10% off their first year’s membership. Click here to take advantage of this deal and sign up to Priority Pass. If you are already a Priority Pass member, you have access to the Aspire Lounge, My Lounge and both the No.1 Traveller lounges in the North and South terminals. No.1 Gatwick in the North Terminal spans 10,000 square feet and combines contemporary design, top-quality facilities and a choice of environments that create a haven away from the bustle of the airport. No.1 Gatwick in the North Terminal challenges and redefines the concept of an airport lounge, complete with an independent travel spa and business centre, delivering an unrivalled experience that makes waiting for your flight a real pleasure. The lounge features a bar, bistro space, living green wall and a variety of comfortable seating areas as well as a carefully renovated mezzanine level that incorporates a VIP room. At the South Terminal lounge there are a variety of games and entertainment options as well as runway views, which means that there is plenty to occupy you until your flight. Executive lounges by Servisair have a Club Aspire Lounge located in Gatwick’s North terminal after security on level 1 of the lounge pavilion. In the Club Aspire lounge you can take advantage of the unlimited free Wi-Fi, complimentary snacks & alcoholic drinks, newspapers and magazines. Children are permitted if they are accompanied by an adult at all times. Think of My Lounge as the cool younger brother of the No1 Traveller lounge. Here you can relax in a loft style hangout area, with private or group seating, complimentary grazing snacks and drinks, curl up in the Family Snug to watch TV or satisfy your inner gamer on the Playstations in the Games Room! Think of the decor of the Clubrooms Lounges akin to that you’d find in a members club; sleek, sophisticated and stylish! Enjoy Champagne, fine wines & spirits alongside delicious snacks and meals. Regrettably, children under 12 are not permitted. Booking for a group opf 7 or more guests? Please speak to the lounge directly as you may be refusedentry if you make and arrive on seperate bookings. 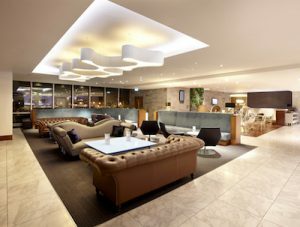 Just as deliciously decandent as its North-site sister, the Clubrooms Lounge South terminal is a one stop shop for pure luxury before you hop on that plane. Enjoy upto 3 hours of bliss as you sip champagne, cuddle up in a comfy chair and eat plenty of snacks whilst making the most of the unlimited wifi!